Rachel Benyola barely slept for a week leading up to Drexel Startup Day. She spent hours honing her slidedeck, getting feedback and practicing her pitch to the judges. Her company, AnneeLondon, was scheduled to go first in the final round of the competition, a situation that she (sarcastically) says created “no pressure!” Her hard work and frantic pace paid off when her strong presentation and confident delivery impressed the judges and earned AnneeLondon a second place Startup Day finish. The ten minute pitch included a synopsis of her product, business plan, strategy and team. To arrive at her winning strategy, Benyola, incorporated advice from business mentors and lessons learned while earning her MBA at Drexel LeBow. She also credits guidance she had received from judges in the earlier business planning phase of the startup competition with improving that aspect of her pitch package. A bike helmet was a strict requirement from Benyola’s mother. It was a rule she accepted, but reluctantly. “I’ve always hated wearing one. I don’t like the way I look or feel in it,” she says. She began sketching ideas and took inspiration from origami as she tried to envision a more convenient helmet with help from product designers. Sketches gave way to paper models, which she brought to cycling events and focus groups with cyclists. Her early focus on potential consumers is an important part of what made her Startup Day pitch so successful. “Rachel impressed everyone, including myself, by being a problem solver who puts the customer first. Sometimes entrepreneurs get caught up in their ideas and lose sight of the customer pain points. Rachel has proven that good entrepreneurship is about listening to your customer, testing your ideas early and often, and being dedicated to the mission,” says Charles Sacco, assistant dean of strategic initiatives at the Close School and a Startup Day judge. The second place finish at Startup Day included a year of co-working space at the Baiada Institute, accounting services and legal help. 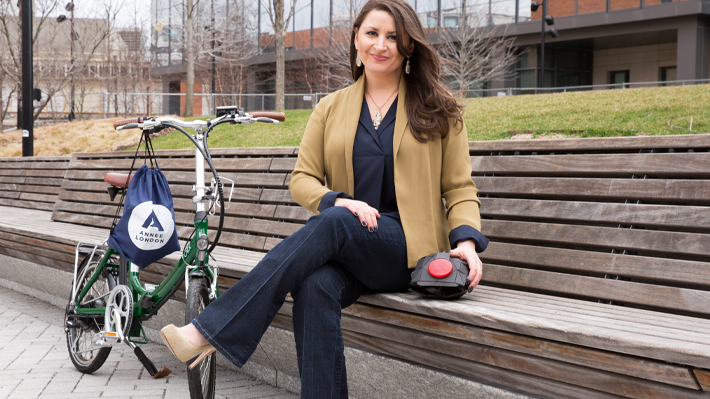 After moving into Baiada, AnneeLondon’s next step is to secure Consumer Product and Safety Commission certification for the flagship helmet. As she awaits certification, Benyola plans to compete in more pitch competitions to spread the word about her brand and flagship product. The London helmet is currently available for pre-order at www.anneelondon.com. Six LeBow students pitched two stocks owned by the Dragon Fund at the Benchmark Investor Symposium.